Here’s our author for today’s Six Question Saturday! Savannah Jezowski lives in a drafty farmhouse in Amish country with her Knight in Shining Armor, her little warrior princess and a loyal brigade of dogs and kitties. 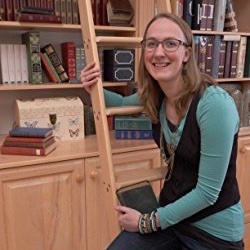 She is the author of When Ravens Fall and is also a featured author in Five Enchanted Roses from … Continue reading "Six Question Saturday with Savannah Jezowski"